Mesopotamia The Epic of Gilgamesh - HISTORY'S HISTORIESYou are history. We are the future. One of the great cities in ancient Sumer was the city of Uruk. Legend says that once upon a time, on the banks of the Euphrates, in the great city of Uruk, there lived a king named Gilgamesh. In fact, a king named Gilgamesh may actually have existed. His name is on the Sumerian List of Kings. Cuneiform tablet containing the Epic of Gilgamesh. The Epic of Gilgamesh tells the story of King Gilgamesh. It was written thousands of years ago. The Epic of Gilgamesh is a story that recounts the many adventures that our hero, Gilgamesh, experienced in his search for everlasting life. The story opens with an unnamed narrator who states, “I will proclaim to the world the deeds of Gilgamesh.” The narrator introduces himself before he introduces the hero, King Gilgamesh of Uruk, and by doing so, he welcomes us into the story. The narrator explains that after Gilgamesh returned from his journey, and after he had rested, Gilgamesh engraved the whole story of his adventures on a clay tablet. It is that story, Gilgamesh’s own story, that the narrator is sharing with us in the "Epic of Gilgamesh." It’s important to know that the ancient Sumerians believed in many, many gods. They believed in super powerful gods, like the god of the sky and the god of the sea. And, they believed in little tiny gods, like the household god who watched over the broom they used to sweep their house, or the god in the tree out back who watched over that particular tree. Each of these magical creatures had special powers. They did not all have the same special powers, but they were each magical in their own special way. These various magical creatures did have something in common. They were immortal, which means they could live forever. The narrator is quick to tell us that the king of Uruk, the great King Gilgamesh, was two-thirds god and one-third man. Because of this, Gilgamesh was far more beautiful and far more courageous than a common person. Gilgamesh was not just a hero; he was the first superhero! Yet, according to this story, he was also mortal, which might explain why he was determined to find the key to everlasting life - so he could live forever like the rest of the gods. Gilgamesh was the King of Uruk. Though he was King, he didn’t care about his people. He only cared about himself. And nobody could do anything about it because, not only was he a king, and not only was he the biggest, baddest guy in all of ancient Mesopotamia, but he was also two-thirds god and one-third mortal. He was strong enough to pick up mountains. He was fast enough to dive down to the deepest point in the ocean and back again in just one breath. But he couldn’t fly. And he couldn’t live forever. It was that “couldn’t live forever” part that really got his camel. After all, wasn’t he a god? Well, not totally anyway. Maybe it was that, but for whatever reason, Gilgamesh was nearly always very cranky. Why did the gods send Enkidu to Gilgamesh? Gilgamesh battles the wild one, Enkidu. He was also very bored. He had run out of cities to conquer. All the monsters ran away the minute they heard he was coming. Basically, he had nothing to do except mope about and scare his citizens silly with his tempers and his tantrums and his bawdy bad ways. The gods looked down and decided that what Gilgamesh needed was a challenge. So, they created a really wild man, one who was stronger and faster than Gilgamesh, and they named him Enkidu. The gods sent Enkidu down to earth to cut Gilgamesh down to size. Enkidu went roaring into the city of Uruk, where Gilgamesh had his palace. Immediately, Gilgamesh perked up. The two men - gods roared and wrestled and bit and scratched, but neither could beat the other. Soon, they started laughing, and they became the very best of friends. Since there was nothing much to do around town, the citizens of Uruk were most relieved when they heard that the two men-gods had gone off to the forbidden cedar forest, looking for monsters to battle. This was very good news, everyone agreed! 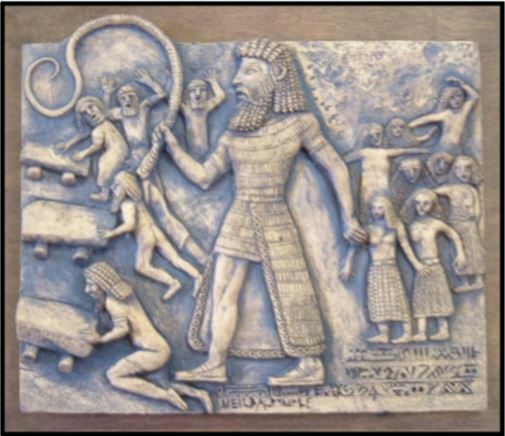 Gilgamesh and Enkidu defeat the demon Humbaba. The forest was forbidden because it was guarded by the evil demon Humbaba. The most evil thing he did was to make fun of people, which hurt peoples’ feelings. Gilgamesh and Enkidu tried to hide when they spotted Humbaba, but his teasing made them so mad that they came out of hiding and ran full tilt into him. Surprised by the attack, Humbaba fell over. Gilgamesh raised his sword to cut off Humbaba’s head, but he wasn’t quick enough. Before he could kill the evil demon, the demon put a curse on Enkidu. Shortly thereafter, Enkidu became sick and died. Gilgamesh was incredibly sad. Enkidu was the first best friend he ever had. Gilgamesh sat in the forbidden forest and drank from the forbidden stream and thought things over. Gilgamesh had heard stories of the incredible plant of everlasting life. He had heard that the plant grew in the darkest regions of the universe. He decided it was time to find this special plant. He started walking. What is the purpose of Gilgamesh's quest? The demons knew the name of Gilgamesh. Some of the monsters that had limped through the pass told awful tales of the horrible Gilgamesh, pointing to a missing tail here and a ripped out claw there. Gilgamesh! With a pop, the scorpions disappeared. Through the pass Gilgamesh crossed, until he entered the kingdom on the other side. In the distance, he saw a beautiful palace. Near the palace was a rather large boat. The boat was laying on the ground, tilted to one side. There was no town, no river, no sea; there was not even a moat. There was only a boat and a palace. The King and Queen who lived in the palace seemed very nice. They even invited him to stay the night, and Gilgamesh accepted. Having assumed Gilgamesh was out and about, visiting lands near his own kingdom of Uruk, over dinner, the Queen asked Gilgamesh if he was having a nice trip. Gilgamesh sighed. He told the King and Queen about the forbidden forest and about his friend Enkidu. “That’s so sad,” sighed the Queen sadly. “I happened to notice your boat,” said Gilgamesh, mostly to change the subject. “My boat!” beamed the King. “Isn’t she a beauty? I built it after the gods warned me about the flood. I loaded the boat with every kind of plant and animal. When the rains came, I loaded my family as well. For six days and six	nights, rain poured down. It rained so hard that my boat was soon afloat. On the seventh day, it finally stopped raining. My boat was afloat on a vast ocean of water. When the sun came out, I sent a swallow to see if she could spot land. But she found nothing. The next day, I sent a dove. On the third day, I sent a raven. And on the fourth day, my boat slowly settled down right where you see it today! In those days, it was still floating. It took a few days for the water to ease away. Gilgamesh shook his head in wonder. The King’s accomplishments made his own seem very small and unimportant. It occurred to him that if anyone knew where the plant of eternal life might be found, this would be the person to ask. The King hesitated. He did know, but did he wish to tell this brash young man? This would take thought. Gilgamesh thanked his hosts for a most delicious dinner and took himself to bed. He was so tired after his long walk that he slept for six nights. While he slept, the Queen convinced her husband to tell Gilgamesh the secret of everlasting life. “That’s true,” nodded the King. “That was very polite of him.” And that just goes to show that good manners really do pay off. When Gilgamesh finally awoke from his nap, and after a huge delicious breakfast of mounds and mounds of pancakes, the King told Gilgamesh how to find the plant of everlasting life. Gilgamesh was excited. He could do that. He could dive to the deepest part of the ocean on one breath. In fact, he knew right where the giant octopus hung out. He usually avoided that part of the ocean. He liked to battle monsters, but he needed air to do it well. Gilgamesh set off that very day, back towards home and the ocean. Once there, he grabbed some heavy rocks and dove to the bottom of the sea. Gilgamesh quickly hit the octopus with the rocks he carried. While the octopus was stunned, Gilgamesh quickly broke off one branch from the tree of life, and shot towards the surface of the sea. With the plant secure, he swam to shore. He was going to eat his plant right away. Then he thought he might hurry into town, waving his prize. Then he decided what he really wanted to do was throw a huge party, apologize to the town for his hideous behavior in the past, promise to change, and then eat the tree of life and live forever! Happily, he curled up, hugging his branch, and fell asleep. While he was sleeping, the gods sent a snake to steal the branch. Only true gods could live forever. Gods that were only two-thirds gods simply did not qualify. The snake quietly crawled up to Gilgamesh and, then, ate the plant! That was not what the snake was supposed to do. In anger, the gods punished the snake by making it crawl on its belly forever. As for Gilgamesh, when he woke up and found the plant gone, he wasn’t worried. He knew he could dive down and get another branch whenever he wanted. He headed for town, wanting only a warm bath and a great dinner. Gilgamesh lived a full rich life. He became a model King. All his people loved him. But he never seemed to find time to dive back down and get another branch from the plant of everlasting life. Why was that, I wonder?